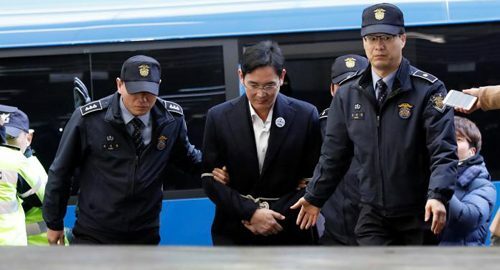 SEOUL – Handcuffed and tied with white rope, the scion of one of the world’s biggest conglomerates, Samsung Group, was taken on Saturday for questioning by South Korean authorities after spending a night in a small detention cell. Samsung Group chief Jay Y. Lee was arrested on Friday for his alleged role in a corruption scandal that has led to the impeachment of President Park Geun-hye. The 48-year-old Lee, who has a net worth of $6.2 billion, heads the technology giant that is the world’s biggest manufacturer of smartphones, flat-screen televisions and memory chips. Lee arrived at the special prosecutor’s office at about 2:20 pm (0520 GMT) clean-shaven and expressionless. He was wearing a dark suit, white shirt and no tie as he was escorted by officials from a justice ministry van. The special prosecutor’s office accuses Lee of bribing a close friend of the president to gain government favors related to leadership succession at the conglomerate. It said on Friday it will indict him on charges including bribery, embezzlement, hiding assets overseas and perjury. He spent the night at the Seoul Detention Centre on the outskirts of the capital in a small single cell with a toilet in the corner behind a partition. Special prosecution spokesman Lee Kyu-chul said on Friday that officials were working to supplement inadequacies in their investigation into Lee, without elaborating. While Lee’s detention is not expected to hamper day-to-day operations at Samsung firms, which are run by professional managers, experts said it could hinder strategic decision-making at South Korea’s biggest conglomerate, or chaebol. Samsung is going through a restructuring to clear a succession path for Lee to assume control after his father was incapacitated by a heart attack in 2014.